Felling requires some considerable space, ideally a clear piece of ground with no obstacles that is at least the size of the crown of the tree (when lying on the ground). If such clear space is available beside the tree (with no damageable plants or structures) then several factors should first be considered by your chosen professional tree surgeon. Any adverse lean or crown weight distribution issues. Any potential decay in the trunk. The wind direction and strength. Can a pulling or winching safety-line be attached? But most importantly, if 'something' were to go wrong - what is the worst case scenario? 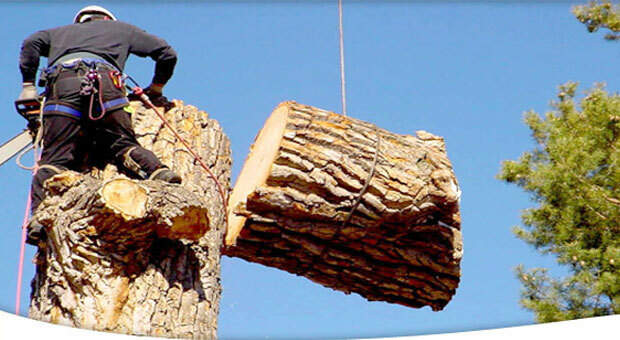 If any factors are not favourable in the safety assessment, it is usually recommended to dismantle the crown of the tree to the point where it can be safely felled (or section felled). In the absence of sufficient space and the necessary physical conditions to fell a tree, section felling can be used to dismantle in sections. Firstly, the individual branches are removed, possibly using lowering ropes and pulleys to get the crown material down into the designated work area below. Once the crown is removed in this manner, the trunk can then be section felled. Whereby, manageable lengths (sections) of timber are individually felled down into the designated landing zone beneath the tree (again, can be done with lowering gear if the rate of decent needs to be slowed). In this way, a tree can be taken down in sections into a small (confined) area where space is limited, and/or damageable structures are close by. Based in central Somerset Arbortech PTS Ltd host an experienced team of arborists and tree surgeons with all the necessary training and experience to carry out your tree work to the highest standards.